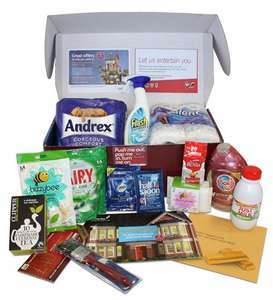 Every home mover in Britain can receive a free Home Move Box. All we need is a request from their agent, who can then order them one on their behalf. The Home Move Box is completely free and contains everyday basic items to get home movers up and running, such as tea, coffee, milk and various cleaning products. Discounts and offers, selected specifically for home movers, are also inside, including special offers from Virgin Media and British Gas. wasn't there something similar a year or so ago - through bounty? but you could register yourself and didn't need to get an agent to do it for you? I can see this being an easy way for junk mailers to keep their list up to date - not knocking the value, just suggesting that you weigh up the pros & cons! We use these at our Estate Agents, the clients love it and costs us nothing! The estate agent we used gave us their own box of goodies when we moved in. Was perfect - had a matches, candles, milk, tea, coffee, plastic cups and all the other stuff mentioned in the move box (apart from the paint brush) all in a plastic storage box. Really helped the first day so we could find our feet. wasn't there something similar a year or so ago - through bounty? but you … wasn't there something similar a year or so ago - through bounty? but you could register yourself and didn't need to get an agent to do it for you? Anyway to do this with an Estate Agents. Mine were *****. I have tried with the agents details but I don't think they will help. Do you know what this box contains? A very good offer, our estate agents use it, and it really helps.